To ideal test conditions, we had the speaker stands LS 70 available, the acoustically fine with the BS 243 and harmony in the corresponding remarks underlined their elegance. Die robuste, einfach zu montierende Aluminiumkonstruktion mit einer Bodenplatte aus Gusseisen kann zusätzlich per Sandbefüllung der Profilkammern beschwert werden und lässt bei der Ankopplung an den Boden die Wahl zwischen Gummifüßen und Spikes. The robust, easy to install aluminum construction with a base plate made of cast iron can also by sand filling the profile chambers and can be lodged in the docking on the ground the choice between the rubber feet and spikes. Für die Verbindung zwischen Top-Platte und Lautsprecher sind Spikes vorgesehen, wobei kleine Plättchen das Furnier vor Kratzern schützen. For the connection between plate and top speakers are spikes, while the small platelets veneer protect against scratches. Was die Frage nach einer würdigen Behandlung der BS 243 angeht lässt sich kurz und bündig nur eine eindringliche Empfehlung aussprechen: Sofern die große Kleine nicht elf Quadratmeter mit Leben füllt, bitte den LS 70 für rund 320 Euro dazukaufen. Regarding the question of a dignified treatment of BS 243 are short and can flush only a strong recommendation: If not the big Small eleven square meters filled with life, ask the LS 70 for around 320 euros dazukaufen. According to the above-mentioned formative experience of 330.3 JET was, of course, the expectation of the BS 243 is relatively high, at least it has the same tweeter and impressed a whole - especially at this price - with equally high as carefully thought out solutions. For warming up during the drawing up plays in the ELAC here soon presented Carat electronics and incidentally already revealed their potential and the family resemblance: It does not require the concentrated hearing with certain music or a designated position in the room to remember that much properly. Very much so, the combination of Carat and BS 243 would simply smooth a thick recommendation on an inexpensive and especially designerisch excellent investment value, which is also challenging listeners to win. Dito in the case of coupling with the 840er CD player and amplifier of Cambridge Audio, in passing the resolution of outstanding and the speed of the JET tweeter clear piano music becomes a pure pleasure. So frugal are the ELAC BS 243 in the positioning and playing their partners, so clearly it rewards the careful preparation with stand, freely and fairly easy to eingewinkelt listening position. And the supply of electronics of the upper class. 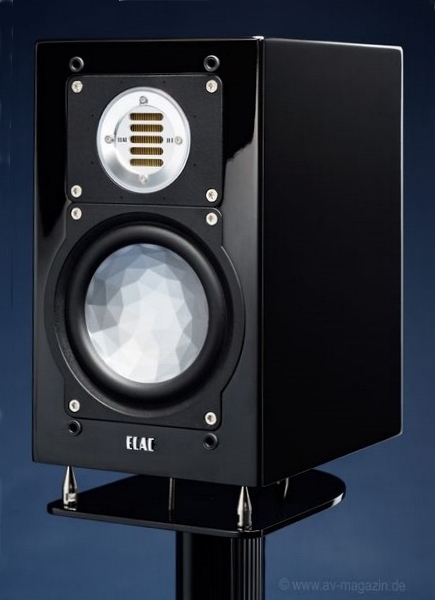 Because one is almost as clear as the beguiling balance, joy and transparency of ELAC: This speaker Chen is anything but harmless phonetically. Even differences between components such as Leema Acoustics and Audionet shows them easily, now exceeds the expectations of them by far. 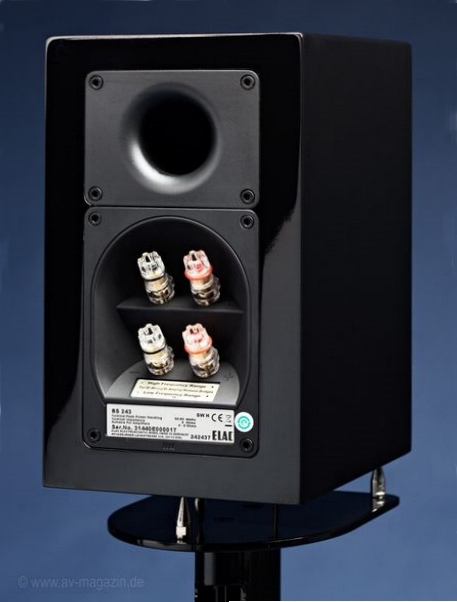 What makes the BS 243 on Audionet ART G2 and the pre-mono Endkombi PRE G2/MAX EPS together? That you do not believe, if you do not even have heard. Instead, the bareness to give in deep hot air registers überanstrengt to shovel, she simply clean and will remain in their own talents, which they now flourish even further. They projected in depth, width and height large stages in the listening room, focused instruments and voices and maintains razor realistic proportions between individual sound events. Even opulent, low reaching compositions by Dadawa, the BS 243 still somewhat credible, despite their naturgemäßen restriction on the transfer range above Tiefbässen. After an intense, sometimes very noisy music, we discuss what the BS 243, regardless of their type and their price can not do and considerably more expensive and larger speakers better. To immediately comprehensible are entirely their price class superior qualities, as ensuring worth many words - it was a great time! The BS 243 can with their distinctive sound capabilities both at once to convince but also to impress sustainable. In the sum of its properties is currently unmatched, ELAC hereby provides an example for a product that an industry can save their honor. Behold: a budget HiFi can really make mood - ELAC BS 243 is a true all-rounder. Fully straightforward regarding placement and control, she just go out and convinced at first in every situation. This compact speaker this very well-made and available in all versions a jewel. Useful features excellent complement the overall picture. The value offered is currently unbeaten, the BS 243 is certainly very loose every euro worth. To make an easy decision to the interested parties and serves customers in terms of value as an industry model. Bravo and thank you!